Posted on September 7, 2007 by Chad O.
TabletPCReview.com has posted a user review of the Fujitsu LifeBook T2010 Tablet PC, Fujitsu’s latest ultraportable Tablet PC/laptop convertible, that just started rolling out within the last month or so. 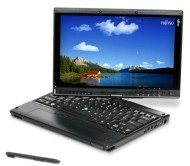 The T2010 deviates from the T4000 line by going with a 12″ widescreen touchscreen instead of a 12″ non-widescreen touchscreen, as well as dropping the optical drive. That, combined with the LED-backlit display option, drops almost a pound of weight off the T2010, giving it a normal weight (normal meaning standard 6-cell battery) of 3.5 pounds. The screen is like looking at a photograph. On maximum brightness, limited outdoor use may be possible, but upon application of the included screen protectors, this dream slowly dwindled. Maybe I’m just spoiled from the deep contrast and rich colors of the 12.1″ widescreen naked. On the short list is something that would allow me to relive this fleeting memory, even if sacrifice of glare resistance is required. As great as this screen is, nothing can match the indoor/outdoor screen option for a “paper-like” appearance; even usable in direct sunlight. If you’ve haven’t purchased it yet, the indoor/outdoor screen should be at the top of the list. If you’re green with envy, and already made the indoor plunge, check out Screentek and for $100, get the finish the T2010 deserves. This entry was posted in Fujitsu, LED Backlighting, Reviews, Tablets. Bookmark the permalink.